1. Heat oven to 350 degrees, place the eggs into a stand mixer and beat on high until double in size, this will take about 5 minutes. In the mean time place the Nutella and peanut butter into a large glass bowl and microwave for about 20 seconds just to loosen them up. Pour 1/3 of the egg mixture into the Nutella and fold in until no egg remains, do this step two more times until all of the egg is well incorporated into the Nutella. 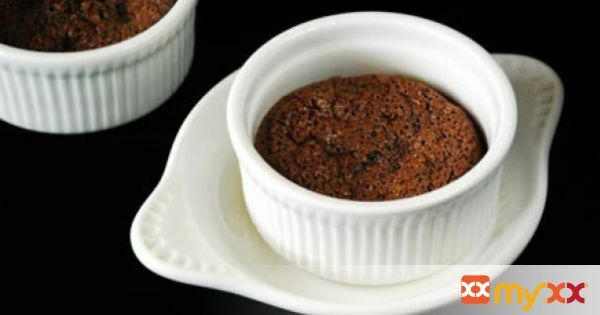 Divide the batter between the 4 ramekins dishes then place onto a baking sheet for easy transport in and out of the oven. Bake for 20-25 minutes or until a toothpick comes out clean. Garnish with some chocolate shavings, whipped topping or a few sliced berries, these little cakes can be served warm, room temp or cold.